BT has launched its new Ultra HD package with a voucher worth up to £500 off the cost of a new LG Ultra HD TV for customers who sign up to BT's new Ultra HD Entertainment Package. The launch comes two weeks ahead of the arrival of BT Sport Ultra HD, which will provide Ultra HD coverage of at least one sporting event every week, starting with live coverage of the FA Community Shield on 2nd August. BT Sport Ultra HD will part of BT TV's Entertainment Ultra HD package, which includes. BT’s new 1TB Ultra HD YouView+ set top box and 47 premium channels including entertainment, documentary and lifestyle channels with 13 in HD and the BT Sport Pack with all of the UEFA Champions League and Europe’s first Ultra HD channel. The price for the Ultra HD package quoted this morning by BT is £15 a month, slightly lower than the £20 charge published last Wednesday in BT's latest tariff guide, although a516digital understands the £15 charge is just for the first 12 months. However, viewers won't be able to access Netflix and its UHD offering on the Ultra HD YouView box at launch. BT says that it is "working on making it available soon". Viewers who order a Ultra HD package will be emailed a voucher code for up to £500 off a LG Ultra HD TV, available to redeem at the BT Shop. The voucher can't be used for any other products. Existing BT TV customers who opt for Ultra HD will need to renew their TV contract for another 12 months, and may have to renew their broadband contract if there is less than 12 months left on the contract. The new Ultra HD YouView box will need to be hard wired to the BT Home Hub, so wi-fi or powerline adaptors can't be used with the service. An engineer will need to visit to install the box. 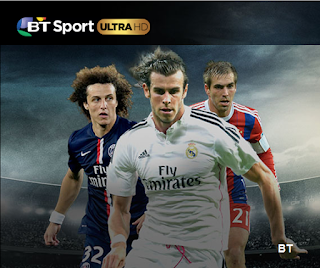 BT's press release says that Ultra HD can be accessed on either BT Infinity 1 or 2 fibre broadband connections. But BT's tariff guide says "Entertainment Ultra HD is only available to BT Infinity Fibre Broadband customers with a minimum line speed of 44 Mb". It appears that BT Infinity 1 customers who currently get up to 38 Mbps download speeds can order Ultra HD if their line can technically take a faster connection. BT is inviting potential customers to call them on 0800 917 7614 to find out more.